Everyone loves candies, either we like to admit it or not, but there is at least one candy we all love. And because of that it isn’t surprising to see candies incorporated in themes that has nothing to do with food, for example slots. Candy theme is very popular in the gaming industry and it would be really hard to find a software provider that hasn’t got at least one slot with a candy theme. The reason for that is quite simple, candies can easily be designed to look cute, attractive and positive, cause in most cases there will be lots of colors used in the designs. IGT in their newest release called Candy Bars shows us their take on a candy theme. They have done a great job with this game and even though it has the commonly used sweets theme as inspiration source, still this game has one of a kind appearance due to the fact that it has a no standard design. Players will be pleased to see a colorful and charming design, which will be pleasant for the eyes even after longer sessions. This game is exciting and there are many possibilities to win big. This slot is the newest release from the popular gaming brand IGT. They are a well established and beloved brand and are well recognized in the gaming industry for their innovative designs and great graphics. In their games collection players will find many known branded slots and Candy Bars is definitely a great addition to their existing games directory. Candy Bars is definitely a one of a kind game as it offers only 4 reels instead of teh standard 5, yet players have 50 pay lines to bet on and the pay lines number is fixed and can’t be changed. That being said, the game has 0.75$ bets as minimum and for players who like to bet higher there is an option to place bets up to 225$ per spin. IGT has made everything easy and comfortable for players as the only thing you need to do to increase bets is to change the coin sizes. There is an auto play option as well for long sessions of play. When it comes to special game features, this slot is like no other. It is hard to think of a game that offers three progressive jackpots that are so easy to access. To get the smallest jackpot, which is called “Snack Size”, the player needs only chocolate bar covering the background of the second reel, and that’s it. If the player has chocolate bars covering the background of reels 2 and 3, then he’s rewarded with the medium jackpot, which is called “King Size” but if all reels, 2, 3 and 4 are covered with it, then the player is rewarded with the biggest jackpot, which is known as “Giant Size”. With no doubt the jackpots attached definitely add a little extra something to this already one of a kind looking game. Other than jackpots, there is also a feature called blackout wins, which basically is a feature where all reels are covered with the same symbol. It isn’t such a hard thing to do as the symbols come up stacked and given the fact that there are also wild multipliers, which give 2x multiplied winnings, players have lots of chances to get great winnings. Candy Bars is a game with a great winning potential. Although we can’t tell an exact number for it’s maximum payouts, we are sure that with it’s three progressive jackpots players have access to big wins. But other than jackpots, it also has a blackout feature, where all the reels are covered with the same symbols. If this feature happens with red 7 icons, which have the highest payouts, then the player will be rewarded with 25,000 coins. Since the symbols are stacked, it is really possible to achieve such wins. Candy Bars is a really fun and exciting game release and IGT has done a great job with the overall concept. This game has a great design and the graphics are impressive as well. 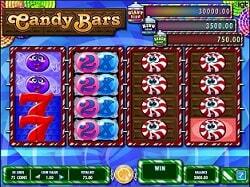 Candy Bars is a great fit for those players who enjoy vibrant colors and comic looking designs, combined with three possible jackpots and stacked symbols. It offers bet sizes that are affordable for all kinds of players and we are sure that you won’t be disappointed to try this game with real money bets.